Basic and Advanced Henna Classes teach you how to do henna art. Henna Workshops for Kids, Beginners and Advanced Artists. We offer henna workshops for Kids, beginners and advanced level artists. 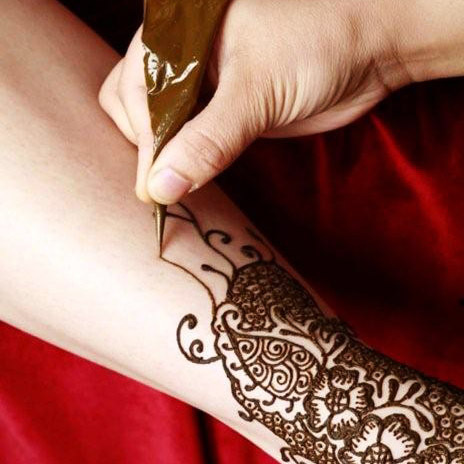 We also offer a very intense course of you are a serious artist and want to start a henna business of your own. Please view the descriptions below for more details. If you have any difficulty in signing up for the class, feel free to give us a call at 503-888-5808. The art of henna is a natural and one of the purest forms of body decoration. It has been passed down from generations and had long been a secretive art form in which its recipes, techniques, and resources were kept from the public. Education in the henna art field has been increasing since the 90's and as more people are exposed to this type of creativity, more and more people are interested in learning to do it themselves. We offer fun and affordable henna classes in which the secrets and proper techniques of this art form are revealed through basic and advanced henna courses. Our henna classes include all resources and related materials. They are very in-depth, hands on classes with limited seating to give each individual one-on-one attention. This fun, yet intense 4-hour henna art class is the perfect class for those wanting to learn this beautiful ancient art form that has been practiced for centuries! This class goes through in-depth training to help you learn the proper techniques that can take months or even years to acquire. It teaches you all you need to know to get started on this exciting journey! Great for beginners. No artistic experience necessary. Everything else you need to learn to start your own henna business! The cost of this class can easily be made back through your first few bookings! Class includes a Professional's Artist Kit, Artist Manual & all other materials. This class is scheduled by request only- $550.00. If you are interested in taking a class, please contact us at 503-888-5808 or via email.